Take an Edible Plant hike into Kananaskis Country. Discover the wild, edible, food forest right under your feet! From the First Nations culture to the early Europeans, many wild plants have been used as food and medicine for centuries. Knowledge is power and nature knowledge is available to you. The Public Lands of Alberta need your engagement, discover the nutritious plants of the forest floor. Sign up today. 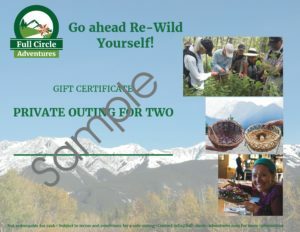 Full Circle Adventures offers edible plant walks in Calgary's Parks. Calgary’s Wildland parks protect many native plant species. Learn about the plants that our ancestors ate when they first settled the land. Experience the texture and aroma of the healing plants that once grew here in abundance. Take home ideas to grow your own; wild food garden! Get your staff outdoors! As a team, explore the natural, food forest in the foothills and mountains of Southern Alberta. On a forage outing for Chefs, Restaurateurs and Distillers, we not only introduce you to safe, edible plants, we take you to a private kitchen to cook them up. Expand your food repertoire into our own, wild Alberta. Learn how to enjoy our mountain landscapes safely. We teach hiking safety, bear awareness, and wild edible plant identification. Develop your ability to read the signs of wildlife while hiking or snowshoeing. Gain a deeper connection and understanding of nature to last you a lifetime. Discover how the natural world, has powered humans for centuries. Her beauty is a source of knowledge, healing, food and adventure. Full Circle Adventures acknowledges the land, stories and cultures of the Ktunaxa (or Kootenay); Îyârhe Nakoda Sioux, (or Stoneys); the Tsuut'ina (or Sarcee); the Niitsitapi that are made up of the Piikáni (or Northern Piegan) Siksika (or Blackfoot) Káínaa (or Bloods). These cultures have occupied what we now know as Southern Alberta for thousands of years providing them a rich and intimate knowledge of this landscape. Today, these cultures are joined by many other indigenous and Metis cultures which reside in rural and urban areas, that have added to the knowledge and practices of the land. As a partner in Treaty 7, we make every effort to respect and use this Indigenous Knowledge as we walk the land, in the manner that we have learned from stories, experiences and practices, of the many cultures mentioned above. The Indigenous people have and continue, to make Southern Alberta home. We value the cultures and promote the important knowledge of the people who have lived in the amazing eco-regions of Alberta.